Driving a new Ram ProMaster High Roof van? The new Ram ProMaster is a break through design here in the United States. Front wheel drive with a flat floor and huge cargo area makes a lot of sense for the professional tradesman. With a roof height of 99 inches getting ladders on and off the roof of your new ProMaster van can be difficult. Many service professionals are choosing VertiRackTM side mount ladder racks to ease and speed up the time of their service calls. having to climb the van, eliminating possible slip and fall accidents. VertiRack's anodized aluminum and stainless steel ProMaster van ladder racks are built to last a lifetime, while costing only a fraction of the price of drop down ladder racks. VertiRackTM makes 1 and 2 ladder ProMaster ladder racks in two standard sizes, but custom sizing is always an option with VertiRackTM. Available to fit all high roof models. Ram ProMaster Van Ladder Rack, Style 13. VertiRackTM Vertical Ladder Racks are available to fit the high roof Ram ProMaster Van. to fit the Ram ProMaster Van, but many optional configurations are available to fit using the ProMaster Van mounting kit. VertiRackTM Vertical Ladder Racks are constructed using only the finest materials to assure a lifetime of trouble free service. 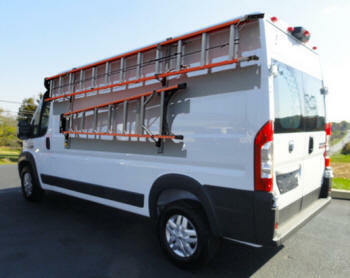 VertiRackTM Ladder Racks for the Ram ProMaster Van offer superior design for ultimate convenience.